Antiquarian booksellers discuss stolen books and how they combat thieves By Jeremy Dibbell Jeremy Dibbell is the Director of Communications and Outreach at Rare Book School, University of Virginia. 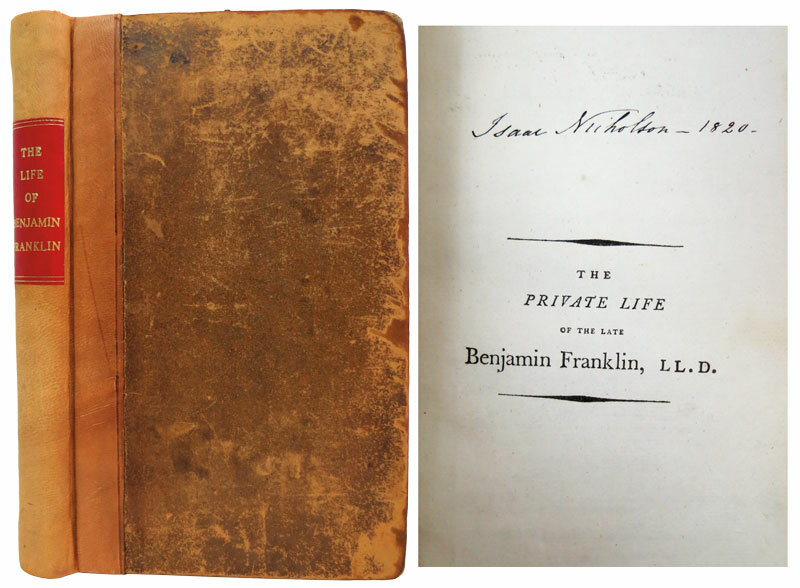 In January of this year, Kimberly Blaker of New Boston Fine and Rare Books reported to the ABAA’s Missing and Stolen Books Blog that this first edition of The Private Life of the Late Benjamin Franklin, published by J. Parsons in 1793, was stolen. The book was shipped to London in a fraudulent credit card transaction, and it has not yet been recovered. Courtesy of New Boston Fine and Rare Books. While large-scale thefts from libraries and museums tend to make news, antiquarian booksellers are also frequently the targets of thieves, whether in open shops, at or en route to and from book fairs, or when shipping books purchased over the Internet. Since the beginning of the year, the Missing and Stolen Books Blog of the Antiquarian Booksellers’ Association of America (ABAA) has recorded fourteen separate instances of thefts or items gone mysteriously missing�four have been recovered so far�and they offer something of a cross section of the kind of theft commonly observed in the trade. One entry details material missing from under a dealer’s table after the Papermania show in Hartford, Connecticut, this past January, which had been purchased by the dealer at the show. Both White Fox Rare Books in Vermont and Roy Young Bookseller, Inc. of Ardsley, New York, reported items absent from shipments back from the California International Antiquarian Book Fair in Pasadena in February, and L & T Respass Books of Northampton, Massachusetts, reported a Confederate imprint pamphlet removed from its booth during the same fair. Books lost during shipment is a particularly vexing problem, said ABAA security committee chair Garrett Scott, as frequently it is unclear when or how this happens and where along the chain responsibility for the losses should be fixed. Peter Stern of Peter Stern & Co. in Boston reported one case where a book he had placed in a UPS Drop Box turned up just days later in another local bookseller’s shop, someone having jimmied the box open and robbed its contents. The book was recovered, but, Stern said, he won’t be using drop boxes to mail packages anymore. One ongoing case of credit card fraud is that of Christian Essian, who went by the name Christian Nettle (and reportedly several other aliases as well). Essian is known to have ordered rare books from several dealers in the US and the UK and had them shipped to a Bloomsbury address in London. He was arrested in February and will face trial in July. The Antiquarian Booksellers’ Association (ABA) and the ABAA security committees have requested that any member bookseller who either sold books to or purchased books from Essian contact Pom Harrington, convenor of the ABA’s security committee, as well as the Art and Antique Squad in London. More details should come to light following Essian’s trial this summer.